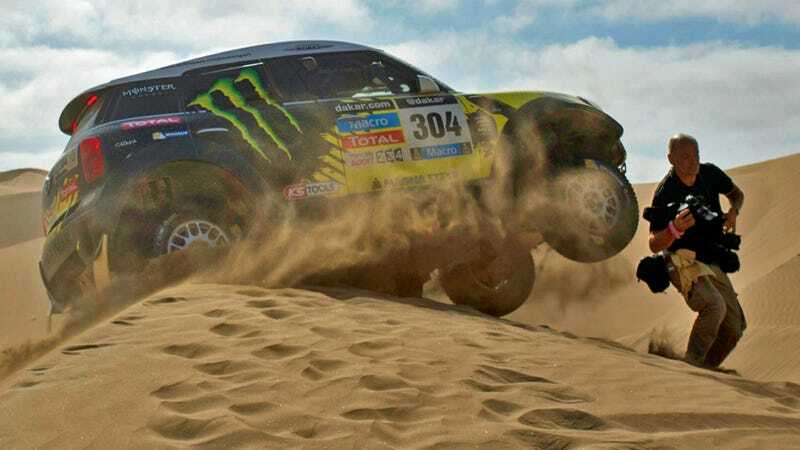 The 2015 Dakar Rally will be running from Buenos Aires, up to Iquique, Chile, into Boliva, and all the way back down to the starting line from January 3rd to January 17th. 70 TV stations will be broadcasting the event. Here's where to watch, and a by-the-numbers breakdown of how the coverage is coming to you. If you find a good streaming source not listed here, please post it up in the comments! This rally stage schedule will give you an idea where exactly competitors will be battling it out on any given day. On American television, NBCSN will provide daily highlights beginning January 5th from 4:30 to 5 p.m. eastern time. France Télévisions is a sponsor of the event and has rights on legal livestreaming. Here's the page they'll be posting videos of the race however you may have to let Google translate the page from French... and they appear to be having technical difficulties at the moment. But surely they'll get it sorted by race time. FranceTVPluzz will be carrying coverage and analysis as well. They'll be broadcasting live to television on France 4 every day of the race at 6:35 PM (Paris time), France 3 at 8:05 PM, and talking to racers in the bivouac (rolling base camp/pit area) for France 2 late-night. France 2 will also be running special features on the Dakar every day at 5:30 PM. So if you're nuts about the race and don't trust the livestream, now might be a time to get a satellite TV? Fox Sports will cover the event throughout South America with over 6 hours on-air every day. In Europe the rally can be seen on general channels (France TV in France, RTL in Holland, TVE in Spain, TVN in Poland). Eurosport will cover the race in Asia as well as Europe. Wherever you are, you'll have to check your local listing for when exactly the race is making it to TV. The various media outfits are dispatching an immense multinational army to film the three-week off-road event, here's a quick breakdown of the equipment that's being mobilized. 120 hours of programming, 8 hours per day including 1 hour 30 minutes of live broadcast.